Does your little lady love stickers? Get her stickers that will stay looking flawless forever with the patched up design of the Speedo Girly Things Leaderback Toddler Girls’ One Piece in Girly Things and Sweet Mint! This sweet mint green and bubble gum pink one piece features a vibrant pattern of stickers with smiley face, koalas, and more cute patterns! Started in Bondi Beach, Australia way back in 1928, Speedo has become the world's top-selling swimwear brand. With fab looks like the Speedo Girlie Things Leaderback Toddler Girls’ One Piece in Girly Things and Sweet Mint made with top grade chlorine resistant Endurance+ fabric, it’s easy to see why the world is in love with Speedo. 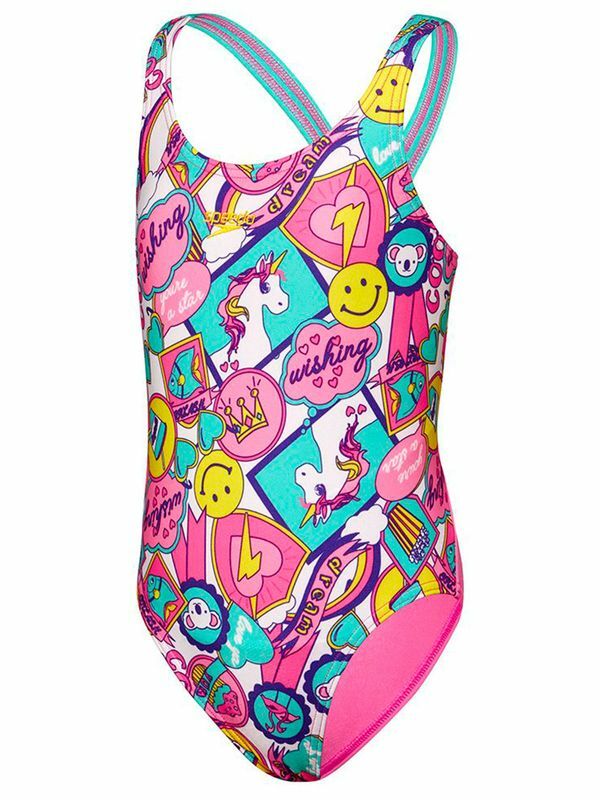 Girly Things Toddler Girls One Piece manufactured by Speedo Swimwear the worlds leading swimwear brand. Speedo is passionate about life in and around the water, creating revolutionary new technologies, designs and innovations.